Author/vlogger Kaleb Nation recently spoke to our friends at Page to Premiere about his upcoming book #SecretKalebBook and was asked about some of the Young Adult movies coming to the big and small screen. Sounds like Kaleb believes that THE MORTAL INSTRUMENTS: CITY OF BONES will be the next big thing to rock Hollywood in 2013. P2P: You’re very integrated into the YA audience, what do you think will be the next big thing? KN: I can’t wait to see the Beautiful Creatures movie! So happy for Kami Garcia and Margaret Stohl on that. There is also a ton of buzz for The Selection by my friend Kiera Cass. 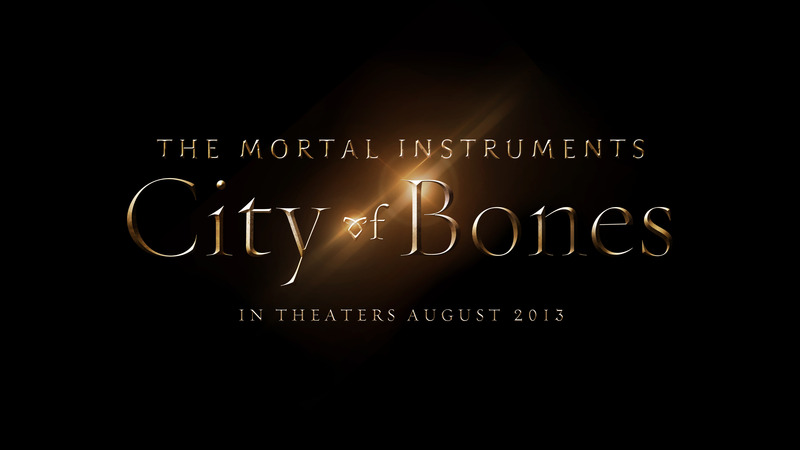 And City Of Bones: I get a feeling it’ll be The Hunger Games movie of 2013. Kaleb has addressed THE MORTAL INSTRUMENTS: CITY OF BONES adaptation a couple of times on his YouTube show The 60SR–a 60 second recap focused on different pop culture topics. I understand what he meant to say, but I don’t like it. Hey Maíra! I almost never reply to comments but I wanted to reply to yours, since I also dislike when people say something is “the next Harry Potter” or “the next Hunger Games” etc. Every book series is unique! When I said that TMI could be the Hunger Games of 2013, I didn’t mean it’s anything similar in the story, I meant that it has a similar explosive popularity and potential to be a mega international hit. They’re completely different but TMI is about to get worldwide popularity very suddenly, just like The Hunger Games did! When I’m answering an interview, I have a really short space to plug other people, and if I say something is “the Hunger Games of 2013” more people will go check it out just because I said it’s the “next big thing”. Oh God, you answered me. Don’t worry, I’m not misinterpretating you. I understand what you said now! Thanks for answering me, anyway. I DID SEE THE TRAILER AND OH MY GOD I LOVE IT, LOVE IT, LOVE IT!!!! I think the song in the background (seven devils – F&tM) worked sooo well I still good the chills – the good ones! I always heard the books and now I’m reading the first one! I sooo looking forward to the reaction to the CoB trailer too!! I wanna see it now – and why are the posters already!!! True, but a lot of people are already aware of The Hunger Games and people–apart from the TMI fanbase and others just discovering the series–aren’t yet aware of The Mortal Instruments. “The Hunger Games movie of 2013” implies a movie that not a lot of people are yet aware of blowing up into something huge, which I think TMI could be. mtX is right “The Hunger Games: Catching Fire will bethe only “The Hunger Games movie of 2013”. It’s pointless to put labels on these things. Aside from both being YA properties I don’t think they are comparable. I think the film can do potentially well and be a breakout hit but given the circumstance I don’t see how it will be pulling THG numbers. Real: Actually prior to the buzz surrounding The Hunger Games when filming wrapped and with the trailer a large number of people weren’t aware of it aside from the book community, fans a few websites. Awareness and book sales for The Hunger Games significantly increased with that buzz and as the marketing campaign began. The Mortal Instruments continues to spend more than one consecutive year on the NYT Bestsellers List, which is a difficult thing to do. I believe once more people are made aware of this series–and I’ve already begun to see it–I think sales will increase. I also believe the series will attract teens and adults, women and men, a diverse audience, which will only help it. There is no comparison between book series as each series is different, but I don’t see the harm in looking at the YA film adaptations and predicting which one has the best chance to have an impact like Twilight or The Hunger Games. When people call something the next Harry Potter, Twilight, Hunger Games, etc. they are talking about something that has the potential to be the next big thing. We won’t know until the film premieres. And they’re still filming. We’re still very early into the movie process. @Alyssa Barbieri: Of course sales of THG were inevitably helped by the movie. That is to be expected but the books were alreaady a phenomenon. I don’t understand why you keep trying to denigrate THG’s popularity or attribute it to the movie. Mockingjay had sold nearly 1.5 million copies in 2010 alone (only a few months after a release). (for some sort of comparison Clockwork Angel was released less than a month later and sold only 330-40 000 copies for 2010). Catching Fire was released in 2009 and sold 918,821 hardcover copies in the 2010 calender year alone; in comparison City of Glass was also released in 2009 and only sold approx. 208 000 HC copies in the 2010 calender year. This was before any movie marketing, before the THG movie had a cast, director (Gary Ross was announced in Nov 2010) or had shot a single frame. THG was already huge before the movie. TMI is simply not in THG league popularity or sales wise and never has been. As for remaining on the NY Times list as far as I can see from the list Cassandra Clare’s books are not near the top of the Children’s Chapters Books category and once you are in the lower half of the list the sales numbers are pretty negligible so it isn’t that hard to stay on as long as sales are steady. There has been an overall upsurge in sales of YA books because they are the trend right now but of Cassandra Clare’s books only CoB, CoA and CoG sell consistently and steadily. I understand talking about next big thing or some comparisons. I do think it’s delusional to compare it to THG, Twilight or HP because the situation surrounding the films and the movies are so different.